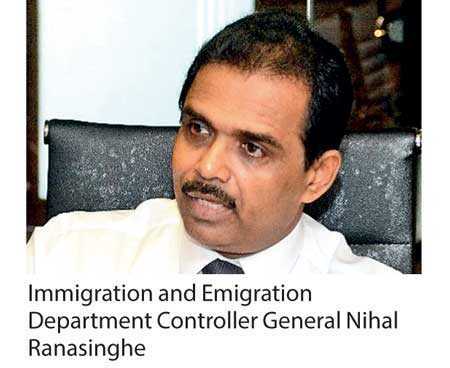 Immigration and Emigration Department Controller General Nihal Ranasinghe yesterday said a newly-drafted Act would be enacted by the middle of next year to comply with developments in the international environment and the country’s priorities. “We have been working on upgrading the existing law from 2015. It is now in the hands of the Legal Draftsman. We hope that it will soon be sent to the Attorney General and thereafter for us to put it into Parliament. According to him, all concerns, including the use of electronic systems to grant visa, biometrics, processing applications and backend monitoring system,have been covered under the new legislation. However, Ranasinghe emphasised the need to establish an intelligence framework suggesting that it would help them to better monitor and authorise work permits. It was also noted that new agencies would be setup under NHRDC to monitor operations. The existing Immigrant and Emigrant Act No. 20 of 1948 had been promulgated in an era when the volume of international movements was limited and a majority of arrivals were by sea. The act governs border management activities including visas for the entry of non-Sri Lankans into the country, inland immigration, detention and removal, while the law also deals with the departure of Sri Lankans and passport issuance functions. Dismissing the allegations that there were 200,000 illegal workers from China, India and Bangladesh, he assured that less than 30,000 work visas had been granted as of 30 September. “The 200,000 that people are talking about is the total number of workers that have come to Sri Lanka from 2005. Most of these workers have left the country after their employment and some visas were revoked. As of the end of last month we have only approved 23,594 active resident visas in the employment sector which includes 7,551 for Board of Investment (BOI) projects, 9,370 for the private sector, 6,589 for the state sector and 84 for the construction industry,” he explained. Ranasinghe insisted that they had the capacity to track any illegal immigrant in Sri Lanka.